On the occasion of the 10th anniversary of the inscription of Vauban’s fortifications on UNESCO’s World Heritage List, the city of Besançon has launched #jaidixans. This new hastag is not only fashionable, it’s easy to memorize, to type and to use. Its aim is to offer visibility to and federate people and sites. In addition, it will help reference any comments connected with 2018 anniversary on social networks. 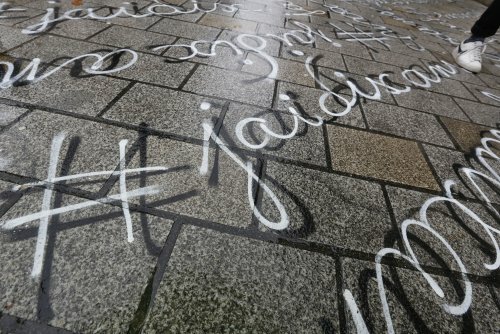 Within the framework of the new communication codes, the City of Besançon, has initiated a huge campaign inaugurated by the graffiti street artist, Léo Mordac. To show that the net has joined the street, the artist spray-painted this new, catchy hastag on pavements and on walls in November. The reason for this innovative approach is to intrigue passersby and incite them to spread the hastag beyond the confines of the city, which will in turn assure the widest possible diffusion. This very real artistic exploit has succeeded as the message has been passed on and on.Now it’s your turn to share your comments and photos on Twitter, Instagram and Facebook so as to breathe life into the ten-year anniversary and #jaidixans. Stay tuned, very soon you’ll find the complete 10th anniversary festivities program right here !